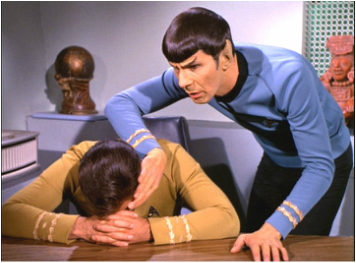 Don’t tell us you’ve forgotten what episode of Star Trek: The Original Series, as they call it now, premiered on this day in 1969 over the NBC television network? This picture should plant the answer to that question in your mind. Well, of course, it would be “Requiem for Methuselah.” And, in the end of this poignant episode, Spock planted a suggestion into Kirk’s mind to “forget.” But we shouldn’t forget, this is one classy Star Trek. The makers of Star Trek: Voyager agreed. In the episode for that series called “Concerning Flight,” Captain Janeway mentions that Captain Kirk claimed to have met Leonardo da Vinci. And, of course, you remember where he met da Vinci, right? Now here is a bit of fun behind-the-scenes stuff: See the picture of William Shatner kissing guest star Louise Sorel? Well something very embarrassing happened right after a bit of dancing and kissing between these two in front of the camera. Ms. Sorel tells you about it in These Are the Voyages, TOS: Season Three, available here and now … and it comes autographed by author Marc Cushman, too.